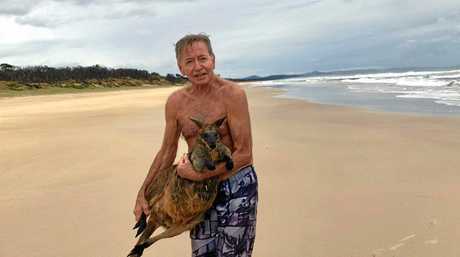 David Hancock shared these photos on social media of two men who rescued a wallaby from the water at Tyagarah. 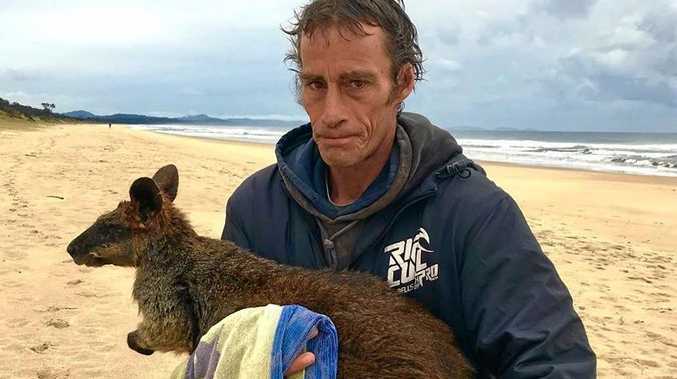 TWO local heroes have braved the waters off Tyagarah beach near Byron Bay to rescue a stricken wallaby. The wallaby was chased down the beach this morning by three out of control dogs and fled into the surf as its last chance of survival. It wouldn't have lasted long if not for the quick action of two men, Dave and Louis, whose actions were documented in a video by local photographer David Hancock. Both men chased the dog away before Steve dived in and pulled the floundering animal out of the surf and laid it down on the dunes to rest. In a post to Byron Bay community board, Mr Hancock said the three then found the owner of the dogs, who was lying in his van in the car park 400m away. "He's quite cranky that I've disturbed him......but I assure him this community is madder than hell with such slack behaviour and wish him a speedy trip home to Victoria..." Mr Hancock wrote. Deon Demouche wrote: "That's so f'ed up. How dare he bring his dogs (plural none the less) to our dog free beaches (for this very reason) and hunt our wildlife. If you all were not there this would have ended tragically. This individual most definitely should be fined - did anyone get the number plate, as I am certain a little precautionary tale isn't going to change his disregard and disgusting behavior?"